Mildred will tell me the gossip. Pop the verb question: What’s happening? Answer: will tell. Will tell is an action verb. Pop the subject question: Who will tell? Answer: Mildred. Mildred is the subject. Pop the DO question: Mildred will tell whom? or what? Answer: Mildred will tell the gossip. Gossip is the direct object. Pop the IO question: Mildred will tell the gossip to whom? Answer: to me. Me is the indirect object. You may come up with a different answer when you pop the DO question in number 3 (Mildred will tell whom? or what?). You can answer Mildred will tell me. True. The only problem is that the sentence then has gossip flapping around with no label. Your attempt to determine the sentence structure has reached a dead end. Luckily for you, all you need to know is that both are objects. Only obsessive grammarians like me worry about which one is direct and which one is indirect. 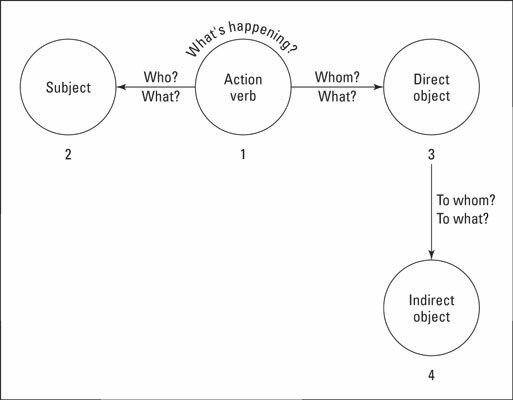 Object or subject complement? Identify the italicized words. Sal seemed soggy after his semi-final swim, so we gave him a towel.